Eric Barberà mentored Amelie Babe during the 2017-18 academic year. As is the case every year, the start of the new 2018-19 academic year means the arrival of new international students at the URV. To help them integrate into cultural and academic life and provide them with a point of reference should they need it, the I-Center puts international students in contact with local students who act as their mentors and help them throughout their time here. Since it was started in 2012, a total of 256 students have participated in the Mentor programme to offer their time and support to new arrivals. In addition to having a high level of English, the mentors are often able to help newly arrived international students by drawing on their own experiences of adapting to life at another university. 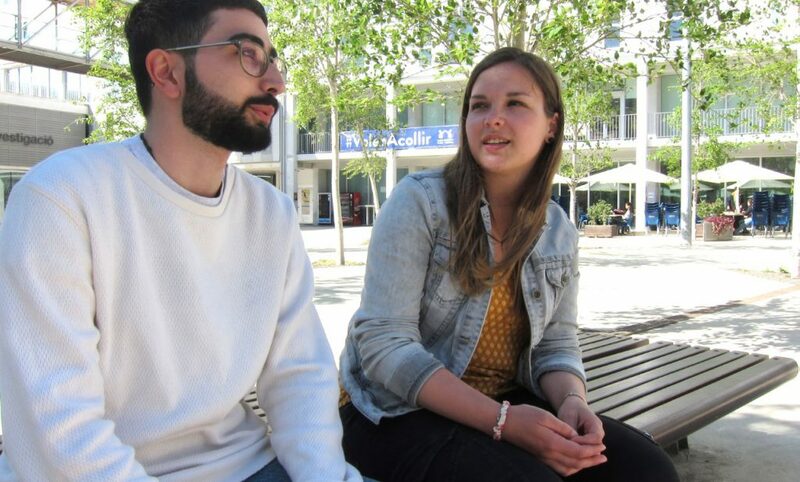 This is the case with Eric Barberà, a student on the Bachelor’s Degree in Economics who has studied in Lyon (France) and who during the 2017-18 academic year was a mentor to Amelie Babe, a Business Administration and Management student from the French city of Roanne who came to the URV on an Erasmus grant. In contrast to what often happens, where the relationship between mentor and international student becomes weaker or is lost after the latter has settled in, Eric and Amelie remained in contact throughout the academic year. “At first she simply asked me questions about practical matters” says Barberà, “but then she started to become interested in the culture and customs of Tarragona”. Amelie Babe said that “I was surprised by the Fiestas of Santa Tecla and above all by the fact that popular drink during the Fiestas is Chartreuse with lemonade and crushed ice, because in France we drink this after a meal to aid digestion”. Barberà advises students who wish to become mentors “to keep an open mind because although you may meet people from Europe with whom you share similar cultures, you may also encounter people from Brazil or China, where the culture is very different”. Although the I-Center offers this service to all newly arrived students, certain students are given priority if they come from very different cultural backgrounds or speak very different languages that local students are unlikely to know. In this way, these students have a greater chance of being assigned a mentor. At the beginning of September, the mentors and international students meet each other after having first established contact through video calls, email or WhatsApp before the start of the academic year. This is when they visit the campus together, look at accommodation options and finalise the details that will allow the international student to adapt as quickly as possible. The I-Center will soon be making another announcement for URV students who would like to act as mentors in the second semester. Although the number of mentors has continued to grow from 19 in 2012-13 to 78 in 2017-18, more volunteers are needed to help internationalise the University. URV students who would like to join the programme can complete the application form on the Mobility website.